This post is sponsored in conjunction with #BrunchWeek. I received product samples from sponsor companies to aid in the creation of the #Brunchweek recipes. All opinions are mine alone. 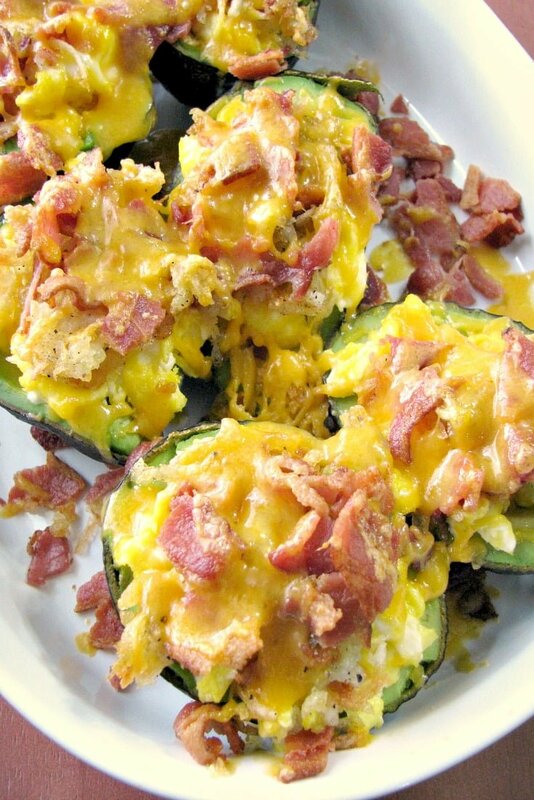 Breakfast Stuffed Avocados are filled with scrambled eggs, hash brown potatoes, crispy bacon, and topped with sharp cheddar cheese. They make a healthy, filling brunch option. Welcome to day 5 of #BrunchWeek hosted by Terri from Love and Confections and Christie from A Kitchen Hoor’s Adventures. This year is even bigger and better than ever! Thirty-eight bloggers from around the country are showcasing their best brunch dishes. We have so many delicious recipes for you to enjoy throughout the week (over 150!!) including cocktails, appetizers, pastries, tarts, main courses, and plenty of desserts! Our BrunchWeek Sponsors are helping us give away some great prizes. Thank you so much, Sponsors, for your generosity. Are avocados low carb? Yes! They are a great low carb choice. A whole avocado contains only 17 grams (5%) of a days worth of carbohydrates. They are packed full of nutrients. Folate, vitamin K, potassium, and many others. They are heart healthy. When eaten in moderation, they can help reduce the risk of high cholesterol, heart disease, and diabetes. They are simply delicious. As a matter of fact, my Baked Seafood Stuffed Avocados from #BrunchWeek 2016 is one of my top viewed recipes daily! Now, add in Eggland’s Best Eggs which are lower in fat and cholesterol, and higher in nutrients than regular eggs, and this egg stuffed avocado recipe is a delicious and nutritious way to start your day! 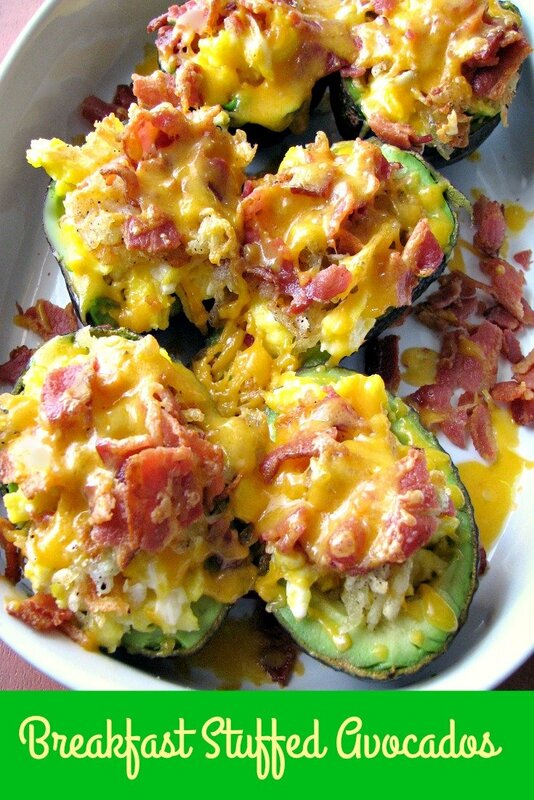 Read on after the stuffed avocado breakfast recipe to see all the other great recipes shared today. AND…just two days ago, in case you missed it, Roasted Red Pepper Asparagus Egg Tarts. 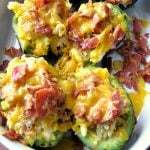 Breakfast Stuffed Avocados are filled with scrambled eggs, hash brown potatoes, crispy bacon, and topped with sharp cheddar cheese. They make a healthy, filling brunch option. Heat 1 tablespoon of the oil in a small frying pan over medium heat. Add the potatoes in a thin layer, season with salt and pepper. Cook until crispy on the bottom, drizzle in the other tablespoon of oil and turn the potatoes, season again with salt and pepper. Cook until crispy and browned. Remove to a plate lined with a paper towel to drain. Cook and scramble the eggs over medium-low heat until just barely set and a little runny. Cut the avocados in half length-wise and remove the pits. Using a spoon, scoop out a well in the center of each avocado. 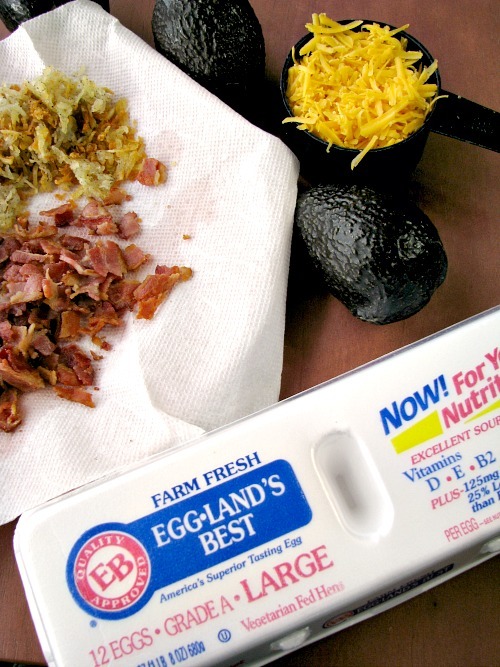 Place the avocado halves in a baking dish and fill with equal amounts of scrambled egg. Equally divide the cooked hash browns on top of the scrambled eggs, then top with crumbled bacon. Sprinkle all over with the cheese. Bake in the preheated oven for 5-10 minutes or until the cheese is melted and the eggs are fully cooked. Serve hot. Nutritional facts will vary due to differences in filling amount and the size of the avocados.